Whether you are suffering from the common cold or struggling with more acute conditions like diabetes, arthritis, or heart disease, here is a book that can finally offer a safe, effective, and inexpensive alternative to drugs. Pioneering research shows that simple movement offers profound benefit and can help prevent, relieve, and sometimes even cure a wide range of diseases. Grounded in solid, Western science, but embracing Eastern concepts of healing, this groundbreaking work offers exercise ‘prescriptions’ for a full range of health problems, including: back pain, menopausal symptoms, osteoporosis, cancer, sexual dysfunction, depression, and carpal tunnel syndrome. The book’s accessible and informative text is complemented by more than 100 easy-to-follow illustrations of ‘healing movements’ drawn from yoga, qi gong, tai chi, and various aerobic and strengthening techniques. Whatever your age, fitness level, or health concern, Healing Moves can help improve not only your physical condition but your overall sense of well-being with chapters including: Exercise for Health and Fitness, Metabolic Disorders, Mental Health Conditions, Orthopedic Disorders, Immunological Conditions, Cardiovascular Disorders, Men’s Health, Women’s Health, and Respiratory Disorders. 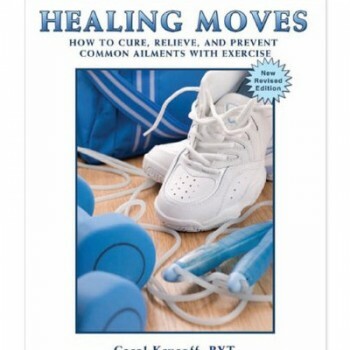 "Healing Moves is an indispensable, readable, science-based resource for people who wish to improve their health with exercise. Special chapters target metabolic disorders (such as diabetes and obesity); mental health conditions (stress, depression, anxiety); orthopedic disorders (back pain, repetitive stress disorder, osteoporosis); immunological conditions (colds, cancer, HIV); cardiovascular disorders; men's health; women's health; and respiratory disorders. For each, the authors explain the condition and how it is affected by lifestyle, its risk factors, and how exercise helps."